I've seen a lot of people like myself having trouble getting my StudioLive Series III to work with DAW mode, what can I check to make sure it's making the proper connection? A problem that too many have is that the Mixer is on one network and the computer is on another network. to which your computer is connected (wired or wirelessly). To troubleshoot the connection we have to check to make sure UCNET is on the same subnet as the device it is going to control. We can do this by checking your Studio One.log to confirm what is occurring. Step 1: Open the Settings Folder. On the Tool Bar in the Help menu is an option for "Open Settings Folder"
Then find the file that says "Studio One.log"
Now you may need to close Studio One because it uses the Log file while the application is open. Close Studio One without closing your file manager window. Side Note: Windows will use Notepad to open it. Mac will use TextEdit to open it. With the log file open, look for UCNET lines. Look for a time out with two different IP addresses. This is an example of a failure. NOTE: The issue here is that the subnets do not match. The mixer is on 10.0.0.19 while Studio One computer acting as the remote client is on 192.168.1.3. Since they are not on the same subnet, there is a timeout as it can't connect. NOTE: These need to be on the same network. The same network is indicated by the first 3 decimal separated numbers, these are the numbers that need to match. Here is an example of a correct match. Your network addresses may be a different set of numbers, the network addresses shown here are just to show as an example. You might be asking how do you make sure the two networks are the same? Go back to the top of this article to see how to properly configure your setup and in the manual, you can go to read how to do that. For Windows, verify that you are running Studio One as Administrator. DCHP is needed for this to work. "If you are running Windows 10 Pro and having network issues, be sure to check if the Hyper V feature is installed on the PC running Studio One. If so, uninstall it or look for alternate solutions as virtual networking can be the root cause of your problem." Dynamic. The IP address is assigned automatically upon connection to the network and can shift to a new address when necessary due to changes in network availability. In this mode, a Renew button is shown onscreen. Touch this button to renew the DHCP lease for your StudioLive. Static Self (Self-Assigned). The IP address is assigned automatically but stays the same thereafter until you need to change it. In this mode, an Apply button is shown. Touch this button to auto-assign a new static IP address to your StudioLive. Static Manual. The IP address can be set manually and remains the same until it is changed. In this mode, an Edit button is shown. Touch this button to open the Static Manual Edit screen, where you can specify IP address, subnet mask, and gateway settings for your StudioLive as needed for your network configuration. Touch each field in the form to bring up an onscreen keyboard for entry. When you’re finished entering the settings, press Apply to establish the new settings. To exit without re-setting IP settings, touch the Cancel button. Dynamic Mode. This is the default setting for StudioLive mixers and is the most common way you will use your mixer on a network. In Dynamic IP mode, the mixer is assigned an IP address by a DHCP server. Because of this, Dynamic IP mode requires that your StudioLive be connected to a network that also has a router connected. In this mode, your mixer will request an IP address from the DHCP server when it is powered on. The DHCP server will then answers and assign the mixer a unique IP address. The mixer will continue to send and wait for an answer to its DHCP requests. Static Self-Assigned Mode. When two network devices are directly connected to each other or a switch, rather than to a network router, they cannot have their IP addresses assigned dynamically. In this case, the devices must be able to self-assign their own IP addresses. 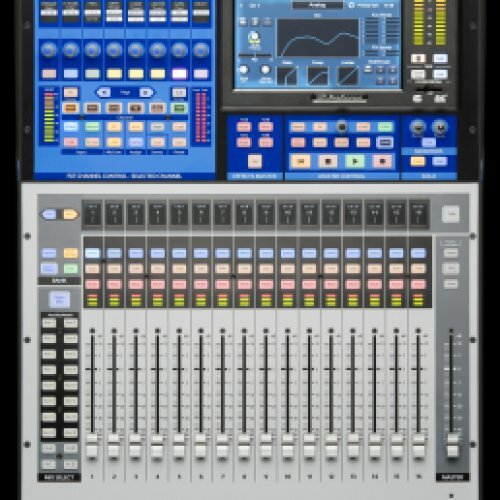 The most common direct Ethernet connection scenario is while using a StudioLive AI console mixer with a StudioLive RM/RML mixer in Stagebox mode or to connect your Windows Touch computer directly to your StudioLive mixer to run UC Surface wired, rather than wirelessly. In this mode the mixer will automatically assign itself an IP address in the 169.254.0.0/16 range, allowing connection with other devices in the same IP address range. Static Manual Mode. This mode is typically reserved for more complex networking installations or situations that otherwise require setting static IP addresses. In this mode, you can manually assign an IP address, subnet mask, and gateway. If you’re not sure how to manually configure static IP address assignments, please consult your IT administrator before attempting to configure your StudioLive mixer in Static Manual IP Address mode. Unless you have a specific need for static IP address assignment, most users would be advised to use Dynamic mode and let IP addressing be handled automatically by your router/network DHCP server. Power User Tip: Network modes are not intended to be changed on the fly. To ensure proper network configuration and connection, always power cycle your StudioLive mixer after changing its IP assignment mode. ​Essentially the same as #1, but walk through the steps in the accepted answer to see what network UCNET is binding to, then open a command shell window and run ipconfig to locate the adapter that is listed in the S1 log file--chances are it is vEthernet; if not, then you will need additional troubleshooting to sort out what your scenario is. Apparently, there was a fairly recent update that implemented this as the default network adapter that is used to route internet traffic through. According to the lead Studio One dev, S1 binds UCNET to the network adapter that is connected to the internet, which after the recent Win10 update, happens to be vEthernet, which is on a completely different IP network than the router your computer is connected to (Windows does some sort of internal routing to make it transparent to the end user). I disabled this adapter, restarted Studio One 3, and my StudioLive 32 is now seeing S1. UPDATE: When you restart Windows 10, and have the vEthernet adapter disabled, a new one will be created by the OS. So, you will have to go and disable this again. This is very inconvenient--it would be a good idea for Studio One to provide the option to select/set the (default) network connection that UCNET binds to when is starts up. YMMV, but this worked for me. I am still not fully connected. From my limited knowledge of TCP/IP, it seems that if a good network connection exists between PC and Series 3, and S1 is still not showing up in the UCNET (yet UC controls mixer ok) than the connectivity problem is software related, not IP related. I have a good network connection, i.e., can ping the mixer from the PC, and they both show up with addresses that are one digit apart. I even changed things up to assign a static IP to the board and computer, with and without a router (using a crossover cable). The log file shows communication happening with 192.168.1.2 and .3 (pc and mixer) ONLY, so I'm confident that I have a good network connection. Still, nothing in the UCNET window besides the default Mackie and HUI. I'll try a different router and/or connecting PC by wifi, but I'm not confident that the problem isn't somewhere else. Thanks for any thoughts.